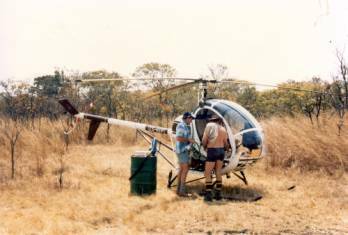 Operation Malawi 1986 was a game capture operation with the purpose of importing Roan, Sable & Lichtenstein Hartebeest. This operation was the first for Dr. Johan Kriek and was a test run for the bigger 1991 operation. 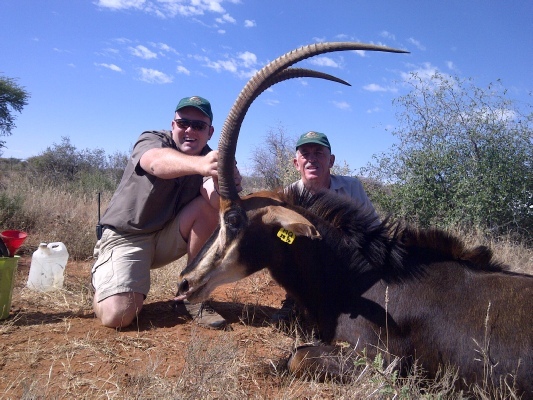 Northern Cape Darting services was established as a commercial guarantee of game capture. Dr. Kriek was one of the pioneers with chemical immobilization of wildlife. 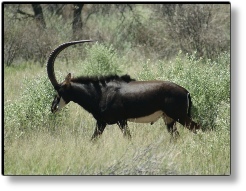 Operation Malawi 1991 was done and Dr. Kriek imported 95 Roan Antelope and 65 Sable Antelope with a success rate of 91%. The animals were flown in by Hercules C-130 cargo planes to a quarantine station in Polokwane. 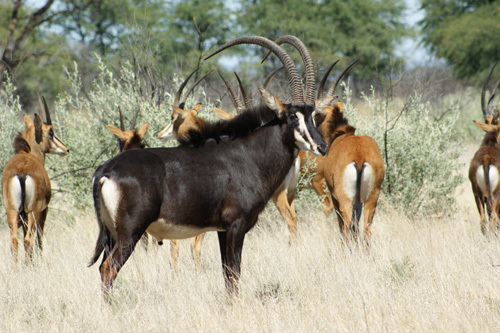 Some of the Roan & Sable antelope were sold to cover the costs of the operation and the rest of the animals were released at Mattanu Private Game Reserve. 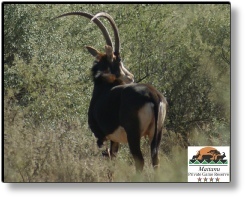 Roan and Sable antelope were breeding at Mattanu and other species were introduced to offer a variety of animals. The selection was not priority at this stage, the main aim was to finance Mattanu’s development and build up the various herds. 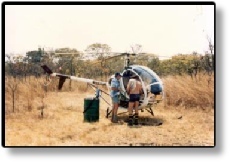 During 1994 Dr. Johan Kriek started a private disease-free Buffalo breeding project at Mattanu. 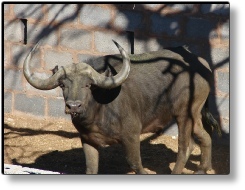 The protocol for the successful breeding of buffalo was written by Dr. Kriek during 1989. The first project in South Africa was given to a mining company and Dr. Kriek insisted on getting permission for his own project as it was his brainchild. 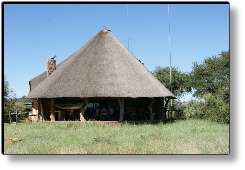 The first accommodation was also built on Mattanu during 1994 to cater for hunting clients. 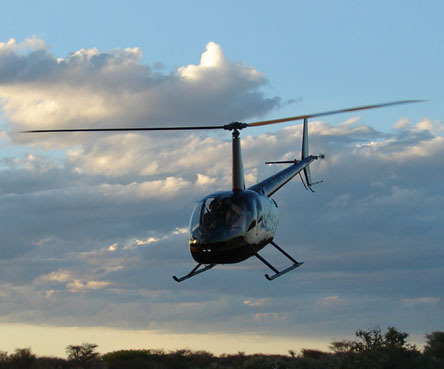 The management of the Johan Kriek Family Trust decided to purchase a helicopter to improve the service to wildlife ranchers. The trust purchased a new R22 Beta II machine and Dr. Johan Kriek and son Johann Kriek completed their training to commercial levels. 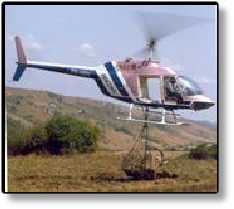 The company Kriek Helicopters (Pty) Ltd was registered and started commercial operations during 2006. 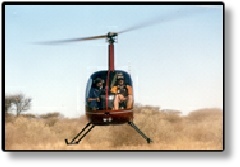 The R22 helicopter is sold and a new R44 Raven II helicopter is purchased. The commercial air charter division is launched with new tourism flights in central South Africa. 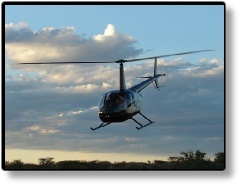 The company offers a service to the wildlife, tourism, filming and mining industries. 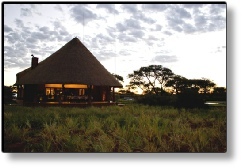 The new luxurious lodge is built at Mattanu Private Game Reserve and a 4 star and AA superior grading is obtained. The lodge is one of the most luxurious in Southern Africa and won numerous awards to date. 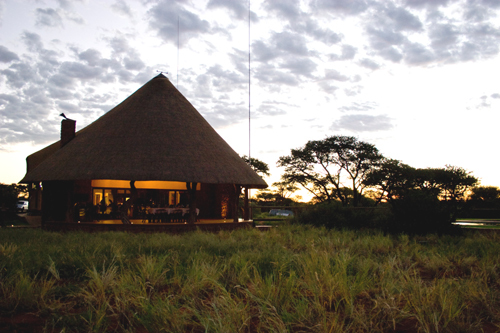 The lodge caters for eco-tourism and hunting clients. The fire of November 2010 will always be remembered. The fire started on a Sunday morning and was driven by a medium strength wind. The firebreaks were not effective against this fire and the whole reserve was burnt down by the second day. 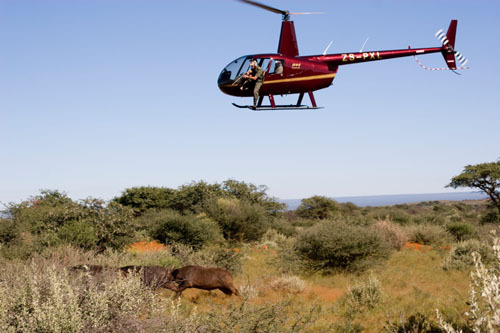 We used the helicopter on the second day to herd the wildlife into burnt out sections. The main lodge and 95% of the wildlife were saved. We thank God for his protection! Mattanu has now been rebuilt and repaired and the reserve had a record rainfall season during the following year. The farmers in our community donated feed and helped us during the difficult time after the fire. The wildlife is breeding well and the grazing and carrying capacity greatly improved as a result of the fire and high rainfall. 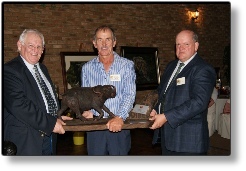 During 2009 Dr. Johan Kriek received the prestigious Wildlife Rancher of the year award at the WRSA annual dinner. He was one of the pioneers of the wildlife industry in South Africa and has been involved with wildlife since 1984. 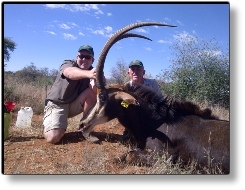 Mattanu Queen was darted and horns measured at 36”. 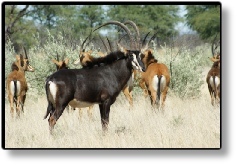 This beautiful Sable cow was moved to anothern area so we could use a West-Zambian bull on her. The cow seems to have a half sister with the same potential in hornlength in one of the breeding groups. Sable bull Andrew is purchased at a game sale. 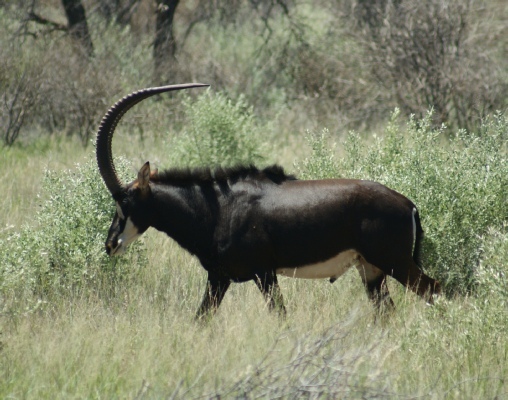 He is the son of the well known Sable “Piet” with a horn length of 53.5 inches. The breeding animals were re-arranged between the three breeding herds at Mattanu. The new bull Andrew is used on the main breeding group. He is 7/8 West-Zambian bloodline. 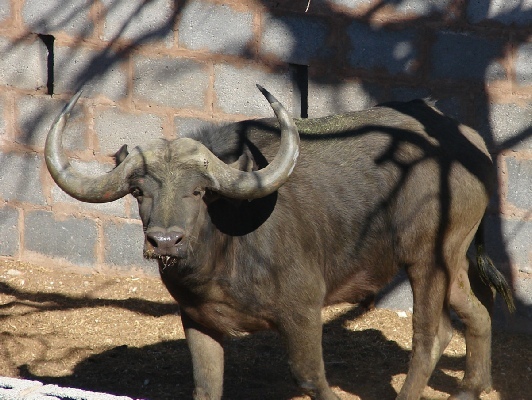 The Kruger Buffalo bloodline is introduced to Mattanu and the bull is named “Shangaan”. The bull measures 37 3/4” spread at only 3 years of age. The new bloodline should boost our Buffalo genetic pool even further. 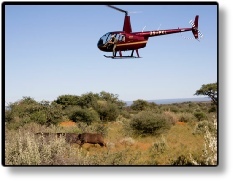 The breeding material at Mattanu already consists of Addo, East African, Eastern Shores, Umfolozi, Tyson & Madikwe. 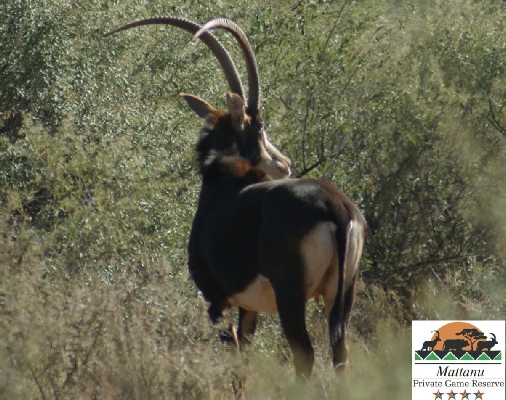 The Kriek Wildlife Auction was held on 23 April 2016. 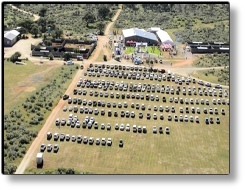 The auction was the first auction since the 1987 auction which was held in Pietersburg (Polokwane). 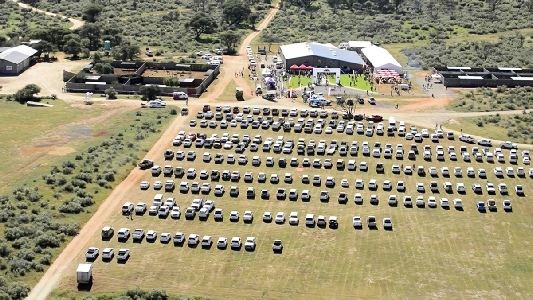 The auction proved to be a major success, attracting buyers from all over South Africa and Namibia.